we humans are little more than their hosts. that find meaning in our lives – or are they more than all these things? substance at all, it will upset a lot of people. view! Let me give you a few glimpses, with examples from my notebook. more provocative than the last. it as 'The Boss of the Plains' and it took the West by storm. flat, no rolled edges. So Stetson didn't invent the cowboy hat – the cowboys must have. The crucial factor is that The Boss was a pricey hat, so each cowboy only ever bought one. They were worn until they fell apart – each night under the stars, rolling the brim, each "yeehaw"
purchasing selections of a hundred thousand cowboys. of cowboys. But it would be wrong to think that the cowboys collectively planned the route. generation. End result: a mindless, unplanned ascent to the hat we know today. there is nothing to select. borrowed from Dutch houses for good measure. farmers wanted them to vary. But, once again, these goggles question that assumption. a pinch of good old-fashioned randomness – just like you or I.
of America's routine experience. Today, Coke now stands for America, or the idea of America. measure the prefrontal cortex – the centre for self-identity – and it lights up like a candle. the one we associate with our personality. apparent. Whereas they say "Pass the budder", I say "Pahss the butta". which had a tight relationship with Britain into the 18th century, lost their 'r's with us. varieties?" and "Is there no such thing as the perfect tepee?". and proud, decorated in wild dyes and flashy iconography. Re:Meme theory: Do we come up with ideas or do they, in fact, control us? But then all at once I found myself giggling like a little school girl when my mind went a step to the left. (Left is the dark side ... sad when one feels compelled to point out ones attempts at humour). Since religion is an idea; and it is proposed all ideas are evolutionary then: RELIGION, DOG, and all the sorted BELIEFS are a result of EVOLUTION and "evolutionary principles", well does that not just bring a smile to your face, the irony that is. Seems this supports the ideas evolve mechanism. Evolutionary epistemology widens the scope of traditional epistemology by inclusion of considerations of the evolutionary origins of human cognitive capacity. The roots of evolutionary epistemology extend back to Charles Darwin's idea of natural selection, set forth in 1859, and to subsequent vivid discussions of the evolutionary origin of human rational capacity put forth by Darwin's followers. Contemporary evolutionary epistemology is based on the work of three seminal thinkers: Karl Popper, Konrad Lorenz, and Jean Piaget. Evolutionary epistemology is an interdisciplinary and constructive theory that aims to unite philosophical views on human knowledge with theories of both human origin and life in general. Evolutionary epistemology suggests that human cognitive capacity is the result of evolutionary development and can be understood only with the help of evolutionary theories that describe the development of this capacity. In fact, evolution itself is understood as a cognition-gaining process: Thus, Gerhard Vollmer suggests that "knowledge is an adequate reconstruction of the outside structures in the subject, and cognition is the process leading to knowledge" (p. 70). Consequently, knowledge can be seen as a tiered phenomenon: On each level, only those responses "fitting" their environment are retained for the future. On the genetic level of knowledge, basic information about the environment is captured in the physical construction of the body by natural selection of those characteristics fitting the environment. A second level is preconscious cognition, which includes reflex-based responses to sudden environmental changes. The third level is that of rational knowledge, in which a person's reaction to the environment is guided by rational judgment. Lorenz used these principles of evolutionary epistemology to critique the Kantian concept of a priori: If cognition is a capacity acquired through the evolutionary process, it is, to any given individual, ontogenetically a priori. However, the origins of human cognitive capacity and knowledge as products of evolutionary processes reach back to nonhuman ancestors, and in that sense should be viewed as phylogenetically a posteriori. Thus, human cognitive functions are shaped by the environment that is known. Furthermore, human knowledge, including its a priori component, is provisional: It is neither infallible nor arbitrary. Its success lies in examining the long-term "fit" between the world and physical/mental appropriations to the world, as found in neural and mental structures of the knowing subject. Therefore, evolutionary epistemology subscribes to hypothetical realism, a special type of realism which claims that human knowledge of the external world is a well-founded and reliable hypothesis about external reality. While it is possible to see the parallel between biological evolution and conceptual evolution (the later being the evolution of ideas) as literal, the real strength of evolutionary epistemology is in applying it analogously to all processes involved in the acquisition of knowledge. Such an extension was established by Karl Popper. His philosophy transforms the principle of elimination of "unfit hypotheses" about reality (occurring on the planet since biological evolution began) to an abstract level of scientific hypotheses. The resulting system claims to provide the basis for the objectivity of knowledge: While social circumstances influence the expressions of beliefs, the beliefs themselves are not caused by these circumstances alone but have an objective component. These principles of selective retention of fitting structures, both physical and mental, lead to a very high efficiency in the entire cognition-gaining process: Only successful variations are retained, thereby becoming a basis for future selective processes. Cases where blind chance seemingly operates in evolutionary processes are in the system of nested hierarchies, preselected by past successes. These principles are applicable to all levels and forms of knowledge-gaining processes, but at the same time do not allow for the reduction of culture to biology. What is emphasized is the parallel to knowledge-gaining processes in biological and cultural evolution. 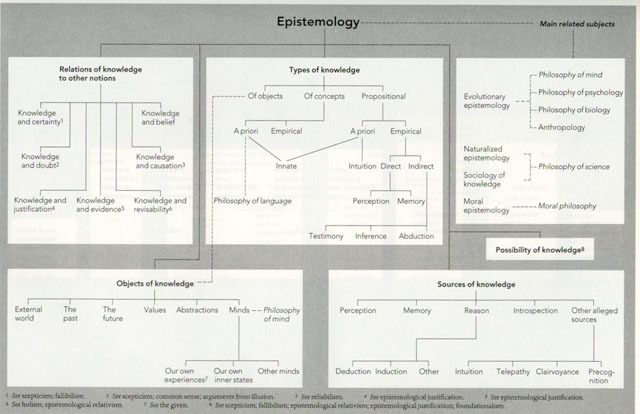 Consequently, evolutionary epistemology is capable of examining the formal structure of any kind of human knowledge, including areas traditionally barred from scientific study, such as religions. Donald T. Campbell suggests that, from a scientific point of view, human sociocultural inheritance is as reliable as biological inheritance. Campbell's proposal was theologically appropriated by Ralph Wendell Burhoe, who attempted to employ the ideas of evolutionary epistemology to relate scientific and religious thought. For Burhoe there is, in principle, no difference between the discernment of the validity of religious beliefs and the discernment of the validity of scientific claims: Knowledge in both areas is acquired through methods described by evolutionary epistemology. Therefore, natural sciences should no longer claim methodological and epistemic superiority over religion. Burhoe, however, went even further, stating that "religious belief systems characteristically involve man's relation or adaptation to some ultimate realities" (p. 30). Implicitly, such a claim points to the reality of God: If one presupposes that selection processes take place through confrontation with reality, and result in the acquisition of information about selecting reality, then "adaptation to ultimate reality" can be translated into "acquisition of knowledge about an independently existing God." Theologically, evolutionary epistemology represents an important new methodological tool. While it does not fall into the trap of natural theology by attempting to argue about God on the basis of knowledge of the world, it advocates that the acquisition of religious knowledge follows the same principles as the acquisition of knowledge of the material world. Since the reliability of cognitive claims is based on the methods used to derive them, religious claims are no longer epistemically inferior to any other kind of knowledge. Critics of evolutionary epistemology argue that survival and reproduction are the only ends of evolutionary development, and that selected knowledge is not true information about reality but merely a situationally successful resolution of a given situation. The success of such a solution is understood by these critics without relating it to reality. While it is correct that knowledge-gaining processes described by evolutionary epistemology do not lead to true knowledge but rather to truly reliable hypotheses, this charge is based on the faulty presupposition that long-term solutions based on evolutionary selection could result from false assessments of external reality. Other critics lament that evolutionary principles are inherently egoistic and, consequently, that the realm of ethics and religion can not be described by evolutionary epistemology. This criticism is, again, based on the faulty presupposition that evolution's primary value is mere survival. Evolutionary epistemology, however, redefines evolution as a knowledge-gaining process that makes the outcome of the evolutionary process dependent upon what has been retained and what is learned. Recently, the findings of evolutionary epistemology have been confirmed by new trends in several disciplines. The most promising discipline is evolutionary psychology, along with new studies in human development and paleontology. While the slowly emerging picture of human cognitive ability seems to be inviting theology as a dialogue partner, advances made during the last two decades of the twentieth century suggest that theology will benefit greatly from including evolutionary epistemology among its methodological tools. Burhoe, Ralph Wendell. "Natural Selection and God." Zygon 7 (1972): 303. Lorenz, Konrad. "Kant's Doctrine of the A Priori in the Light of Contemporary Biology." In Learning, Development, and Culture, ed. Henry Plotkin. Chichester, UK: Wiley, 1982. Mithen, Steven J. The Prehistory of the Mind: The Cognitive Origins of Art, Religion, and Science. London: Thames and Hudson, 1996. Popper, Karl Raimund. Objective Knowledge: An Evolutionary Approach. Oxford: Clarendon Press, 1972. Vollmer, Gerhard. "Mesocosm and Objective Knowledge: On Problems Solved by Evolutionary Epistemology." In Concepts and Approaches in Evolutionary Epistemology: Towards an Evolutionary Theory of Knowledge, ed. Franz M. Wuketits. Dordrecht, Netherlands: D. Reidel, 1984. Source: Encyclopedia of Science and Religion, ©2003 Gale Cengage. All Rights Reserved. Full copyright.